A Guide for First-timers – Welcome! If you’re reading this page there’s a good chance you’re thinking about or have decided to join us for a concert. Thank you! Here at the Prince Edward Island Symphony Orchestra (our friends call us the PEISO for short) we want to make sure people who are newer to classical music and concert going have a great experience. If you do, we hope you’ll come back again! And again! To help acquaint you with the “symphony experience” we’ve answered a few of the questions we’re frequently asked about a PEISO concert. When and where do you perform? 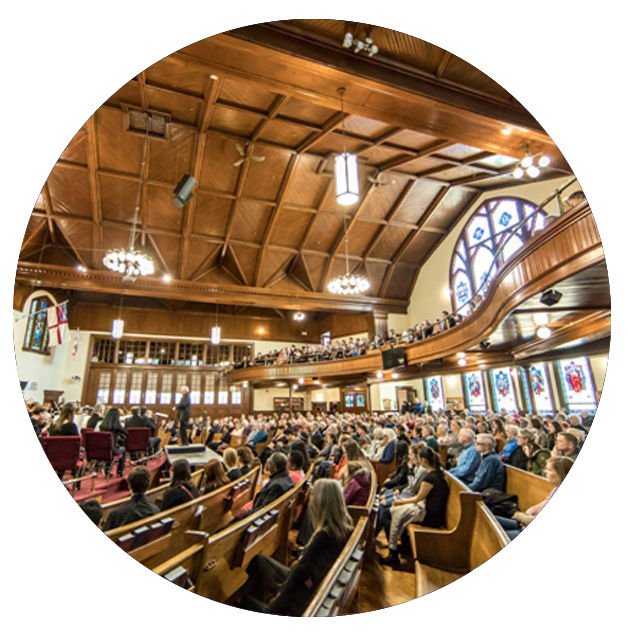 We present four concerts a year in October, November, February and April at two locations in Charlottetown: Zion Presbyterian Church and the Confederation Centre of the Arts. Concerts begin at 2:30pm, and there is usually a pre-concert talk about the music at 1:30 pm. Recently we expanded our programme to include small chamber performances. Under the headline “The PEISO Presents” they take place across the Island throughout the year. Our goal is to reach new audiences and perform in new venues making us, true to our name, an orchestra for residents and visitors Island-wide. Concerts begin at 2:30pm and end between 4:30 and 5:00pm depending on the programme. A single concert is $40.00 and can be bought online, at the Confederation Centre Box Office, or at the door. Please note that services charges apply to tickets purchased through the Centre Box Office. Our season subscription is a great deal – only $120.00 for all four concerts. At a savings of $40, it’s like getting one concert free. And you get to select your seats at the Confederation Centre in advance. Buy a subscription during our Early Bird Special (offered only in April and May) and you pay only $110 for the season. That’s another $10 saving. If you’ve bought an individual ticket and would like to subscribe to the rest of the season our information desk can help you during intermission or after the concert. Or you can give our office a call 902-892-4333 or email us admin@peisymphony.com for details. I’m a student on a tight budget. Is there any special deal for me? Just show your student ID and you can reserve a seat for $15. Better yet, a student season subscription runs only $40. Now that’s a deal! Students and young people on an even tighter budget can request free tickets that are underwritten by our John Clement ‘Send a Kid to the Symphony’ Memorial Fund. I’d like to introduce my children to the symphony. Is there any discount for children? Thanks to our John Clement Memorial Fund we offer one free youth ticket for each accompanying adult who has purchased a ticket or subscription. Combined with the Early Bird Discount, a family of two adults and two children can attend all four concerts for only $220 – quite a bargain. Free tickets are provided for caregivers accompanying a concertgoer. Periodically, we offer other special discounts for recent immigrants and other special groups. Call our office 902-892-4333 or send us an email admin@peisymphony.com for details on any of our student, youth, caregiver and special offers. When I buy a ticket, how do I know what’s a good seat? For an orchestra concert many people say the best location is in the centre. Being not too close to the stage helps the sound blend a little better by the time it hits your ears, and you get a great view of the musicians and conductor. If a piano soloist is performing, people like to sit towards the left side of the house so they can see the pianist’s hands. However, a seat on the side is a good way to watch what the conductor is up to. The balcony (when open) is a great place to get an aerial view of the entire orchestra. Balcony – many season subscribers prefer sitting here, however patrons in the back three rows may find it more difficult to watch the soloists who often perform on a stage extension. I would love to attend the concerts but have a mobility issue. Are the venues equipped to accommodate me? The ground floor at both venues is accessible for anyone using a mobility aid. Unfortunately the balconies are accessible only by stairs. 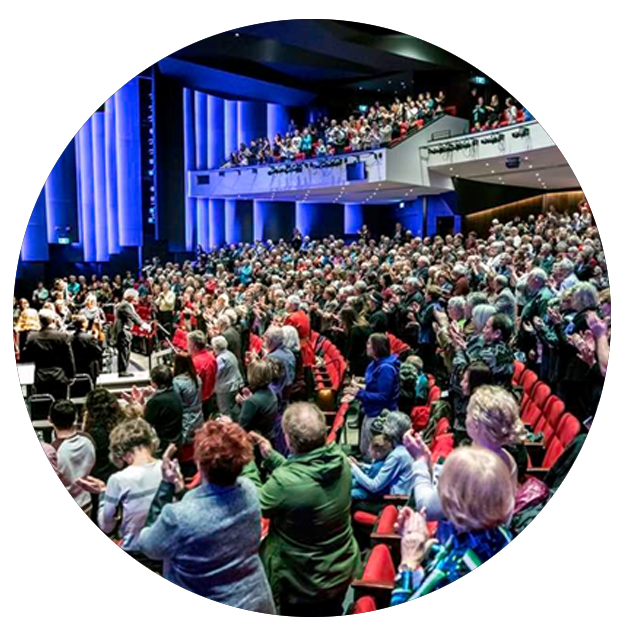 Should you required the assistance of a caregiver we are more than happy to offer the person accompanying you a free ticket – simply use the coupon code ‘caregiver’ on the Confederation Centre’s Box Office website. Parking in downtown Charlottetown on Sunday afternoon is usually not a major challenge. The most popular option is free on-street parking near the performance venue. It isn’t what you wear that’s important, it’s that you’re here. Some people dress up! If that’s your style, great! You won’t be the only one, we promise. If more casual works for you it works for us. We want you to be comfortable and enjoy yourself. Can I get a drink or refreshments at the concert? Confederation Centre: There is a bar and concession in the foyer where you can purchase snacks and a drink (alcoholic or non – the choice is yours) before the concert or during the intermission. Zion Presbyterian Church: Zion is not a licenced facility, however refreshments are available. The Women’s Auxiliary at the church offer yummy home-baked goods, coffee, tea or water before the concert and during the intermission. This is a New Experience for Me. Do I Have to Study-up before Attending? No you don’t! You can come and just enjoy the music. However we have a few things to help you double your enjoyment. A free house programme is distributed when you arrive that will tell you a bit about the artists and what’s being performed. 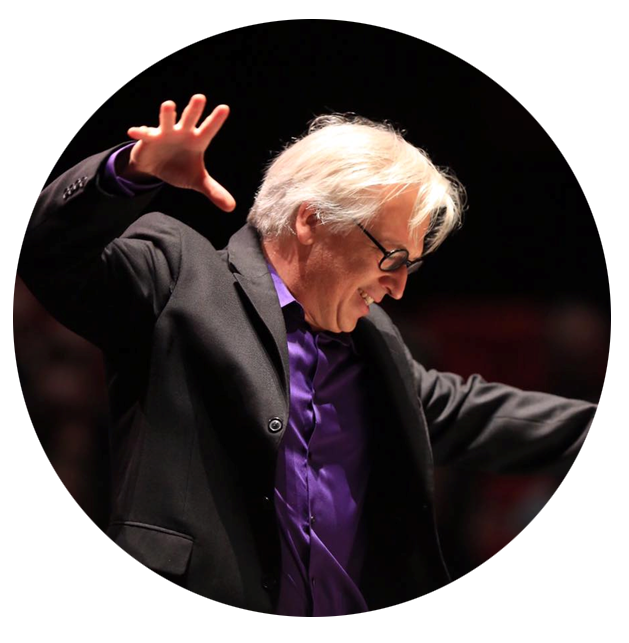 Our Conductor/Music Director Mark Shapiro (he is also referred to as the orchestra’s Maestro), as well as occasional guest conductors, may introduce the pieces to be performed from the stage. Consider attending the free pre-concert chat with the Maestro and guest performers. The chat starts one hour before the concert at 1:30pm and lasts about 30 minutes. The Maestro may tell you why he programmed a particular piece, things you should listen for during the performance, and information about the composer. Often, the soloist will also join the talk and you get to hear from the amazing artist you’re going to see perform. If you do want to study-up ahead of time, we have several ways to help you do that. There are links on our concert website to a more comprehensive version of our programme notes which include a close look at each piece and the composer. We’ve also included some little known, fun and often funny facts about the pieces, the composers, and past performances. As well, we provide links to in-depth analyses should you wish to explore further. We begin with our national anthem, often conducted by a special guest chosen from the audience. You may even want to volunteer! A concert may open with an overture or a shorter work about 10 minutes in length. That can be followed by a concerto with our soloist or an orchestral piece lasting 20-30 minutes. A 20-minute pause allows you to try the goodies at Zion or grab a drink at the Confederation Centre. The second half often features a full symphony with several movements or another major work lasting 40-60 minutes depending on what the composer wrote (and how fast the conductor conducts!). One of our concerts is dedicated to exploring the links between classical and popular music. The list of musicians who have performed with us for the second half of our “Roots” concerts is a who’s who of Canadian music. This year David Myles joined us with that brand of quirky music that is uniquely his, and he had a 75-piece backup band! When is it time to applaud? This can be a controversial question. In the old days audiences could be pretty rowdy – they talked, clapped and even booed during a performance. On occasion it could get physical with things thrown at performers. At some point in the 20th century things changed and it became fashionable to applaud only at the end of a piece but not at pauses between movements. The trouble is if you don’t know this unwritten rule, you may clap at a pause in the music and then feel embarrassed because you’re the only one. Don’t be! Do it! It means you had an emotional reaction to the music that you want to express. What About Cell Phones and Pictures? No one – musicians or audience – likes hearing cell phones joining in the music making during the performance. Please make sure your phone is on silent out of consideration for the performers and other audience members. It’s distracting to the people around you and performers when you take pictures during a performance, so please refrain from doing so. We want you to share your symphony experience with friends and family, so feel free to take selfies, check-in and post on social media but please do that before the concert begins or during intermission. And we love it when you share your pictures with us so feel free to send them on. Hopefully a great experience! Seeing and hearing seventy-five musicians performing, whether producing a giant wall of sound or softly fading to silence, can be awe-inspiring. People say there is something special about the live concert experience that just can’t be beat and that’s music to our ears! We hope this guide has answered all your questions. If not, we’d love to hear from you with your unanswered questions and suggestions for how we can make your concert experience more enjoyable. Send us a message on Facebook https://www.facebook.com/PEISymphony/ or by email admin@peisymphony.com and we’ll do our best to answer it. We might add the question to this list to help other first time concertgoers.